Located at the foot of the Muslim heritage Alcazaba, Malaga on the Costa del Sol welcomes travelers with its newly expanded airport. Malaga is growing rapidly and is becoming a modern city with new transport infrastructure, modern city hotels and an increasing cultural offer, which along with its great location on the shores of the Mediterranean Sea, surrounded by mountains and an almost always blue sky make it an attractive place to visit. Malaga is synonym for sweet wines, flamenco, Picasso, beaches, golf, tapas and shopping combined with the relaxed attitude of the south. There are many local festivals and the locals love to celebrate. The people of Malaga love their August Fair, a major event in the local calendar. Easter processions can be thrilling for visitors to the city during this time of year. Find the city life in the cultural town of Malaga or contrast it by experimenting the exclusive the jet-set life in Marbella. International tourists have chosen the Costa del Sol since the sixties. The beaches and sunny weather made Torremolinos and Benalmadena to become mayor resort areas. Celebrities from around the world began to choose Marbella as the preferred site where buying a second home. Currently, the contrasts are great between the cities of Marbella, Fuengirola, Benalmádena and Torremolinos and the life in Malaga city. In the same line as Granada, Malaga is a major university town, which is reflected in prices that are lower in than in other tourist areas such as Marbella. Enter the relaxed and friendly atmosphere of the Costa del Sol and don´t be surprised if local people want to start a conversation with you on the bus or on the street. The cultural city of Malaga offers a wide selection of museums. In the Plaza de la Merced is the birthplace of Picasso. The house is now a museum showing some of the artist’s works. Picasso is also present in another museum, the Picasso Museum and within walking distance of the Plaza de la Merced. The CAC Malaga, in the city center, is the museum of contemporary art. Granada has the Alhambra, Malaga has its Alcazaba, a fortress of the Muslim era. After visiting the fort, take a coffee or mint tea a bit further down in the Plaza de la Merced. Sit back and enjoy the sunshine on the terraces during the day or come back here and have a drink at night. Also visit the popular Garden of the Conception in the north entrance of the city. This is one of the most beautiful gardens of Spain, famous for its archeological collection. In Puerto Banus, Marbella you find the glamorous life of the jet-set, shiny yachts and exclusive restaurants. This is the favorite holiday spot for the holidays of celebrities. Marbella has a close relationship with the royal family of Saudi Arabia, which has a palace and a mosque in the “Golden Mile“. Filled with small bars and cafes, the quality of life in Malaga is very high. Enjoy the summer breeze while taking a coffee in one of the beach bars. The Mediterranean climate is pleasant and brings the sun to Malaga much of the year. The combination of sea and mountains ensures mild winters and hot dry summers. It is advisable to wear sunglasses and good quality sunscreen with a high SPF when visiting one of the most authentic cities in Andalucia; But Andalucia is large, Malaga car hire will provide you with the needed mobility, check our prices and start planning your driving tours from Malaga. 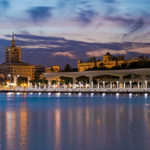 « Malaga and the Costa del Sol – Heading for the sun Coast!